In this section, we introduce basic concepts about projection from a camera. Linear transformation: a formal definition can be found at MathWorld. Here, we will consider a linear transformation as a mapping from two spaces where lines become lines or points. This model is illustrated in figure 3. Even though it is very general, I will only present what is necessary for the algorithms presented next. The matrix K contains the internal parameters of the camera. That is where we put the focal length f, which is the distance from the projection plane to the projection center. In the next algorithm, we will want the projection center c = (0, 0, cz) to get further away from an unchanged projection plane. In the camera model, this is equivalent as decreasing cz and increasing f by the same value. Also, in the rest of the explanation, we will always make the assumption that the projection center is located on the negative Z-axis. This is because we want to ensure that it stays behind the projection plane located on Z = 1. Nevertheless, the algorithm will work for any camera configuration (perspective ones) because we can always change the coordinate system to get this configuration. This is related to R and c, the rotation and translation matrix of the model (figure 4). 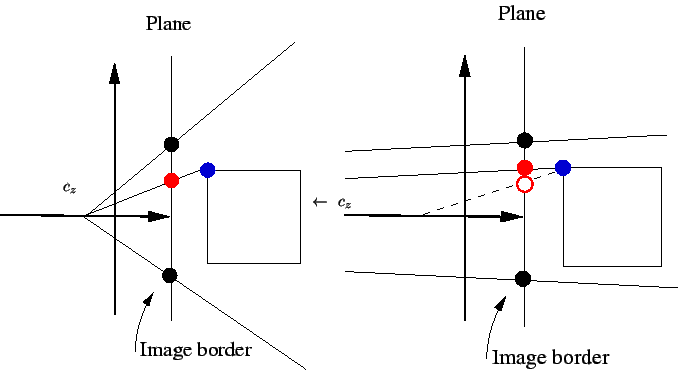 Figure 3: Pin-hole camera model . 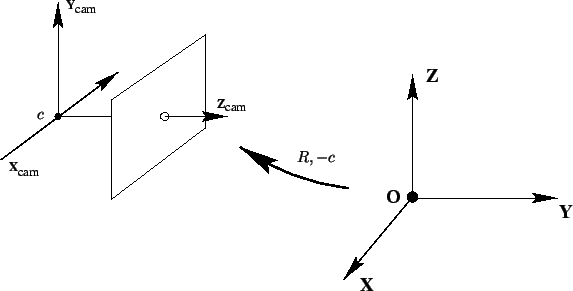 Figure 4: Pin-hole camera model: changing the coordinates system so the projection plane is at Z = 1 . In this figure, the camera center is (0, 0, 0), because f = 1. Before beginning with the actual problem we are facing in this project, I will illustrate the effect of increasing the focal length f and decreasing cz by the same value. What is the effect of this transformation? First, it keeps the projection plan at Z = 1. Consider left part of figure 2, this is the side view of the field of view of a camera when f = cz = 2. In the right part of the figure, you get the effect of changing the parameters. First, there is a zoom effect. This is because the field of view decreases. Also, the perspective effect is reduced more and more. This is because when f and cz , the perspective projection becomes an orthographic projection. In the latter, all relative angle are preserve. Figure 5: Effect of increasing the focal length. For the purist, this is not exactly consistent with what the camera model really does, but the effect is exactly the same. How can this be useful? Essentially, the overall aspect of the object changes. Points in the image move and line relative angles change too. Also, a very important result in projective geometry states that changing a linear transformation in a continuous manner induces a continuous transformation of the object in the new space. Thus, when changing cz and f, the points and the lines in the images move continuously.